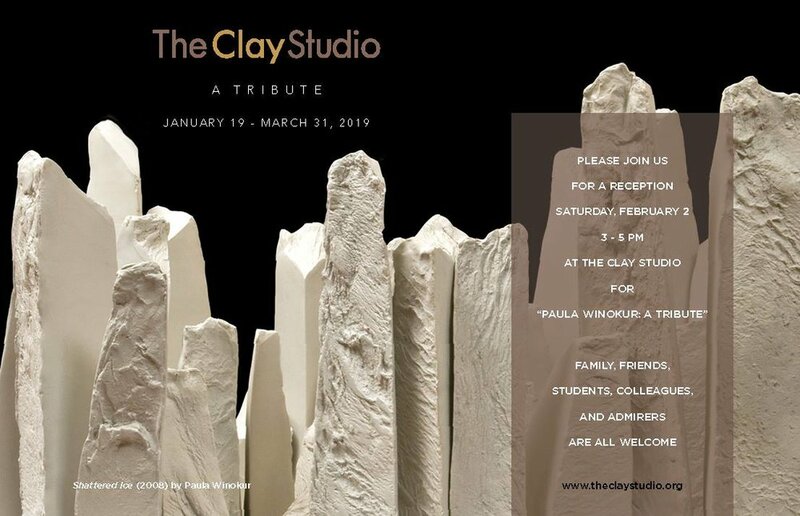 Please join us for a free reception on Saturday, February 2 (3 – 5 pm) at The Clay Studio for "Paula Winokur: A Tribute." Family, friends, students, colleagues, and admirers are all welcome. February 4 marks one year since the passing of revered Philadelphia ceramic artist Paula Winokur (1936-2018). The Clay Studio honors her legacy with an exhibition of works from her studio that span the length of her career (nearly six decades). Paula Winokur: A Tribute includes a look at the environmental themes that are prevalent through Winokur’s early landscape boxes to her most recent iceberg sculptures inspired by trips to Iceland and her concerns surrounding global warming. Stay after the tribute and meet the 10 current Resident Artists from 6 – 8 pm. Hear about their background, inspiration, and time in The Clay Studio residency. Artists include Joshua Hebbert, Stephanie Kantor, Yehrim Lee, Nicholas Lenker, Andrea Marquis, Roberta Massuch, Jacob Raeder, Amy Shindo, Jason Lee Starin, and Nathan Willever. Each will give a short talk about their work. This event is free to attend and open to the public.